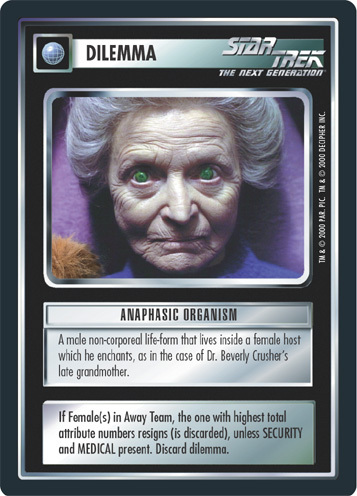 A male non-corporeal life-form that lives inside a female host which he enchants, as in the case of Dr. Beverly Crusher's late grandmother. If Female(s) in Away Team, the one with highest total attribute numbers resigns (is discarded), unless SECURITY + MEDICAL present. Discard dilemma. Image Source: The Next Generation: "Sub Rosa"